Tom + Chee, located on Howell Mill Road is a specialty grilled cheese and tomato soup restaurant chain. In addition to the nearby restaurant in Atlanta, Tom + Chee has other locations throughout the Midwest and scattered locations on the eastern seaboard and the west. 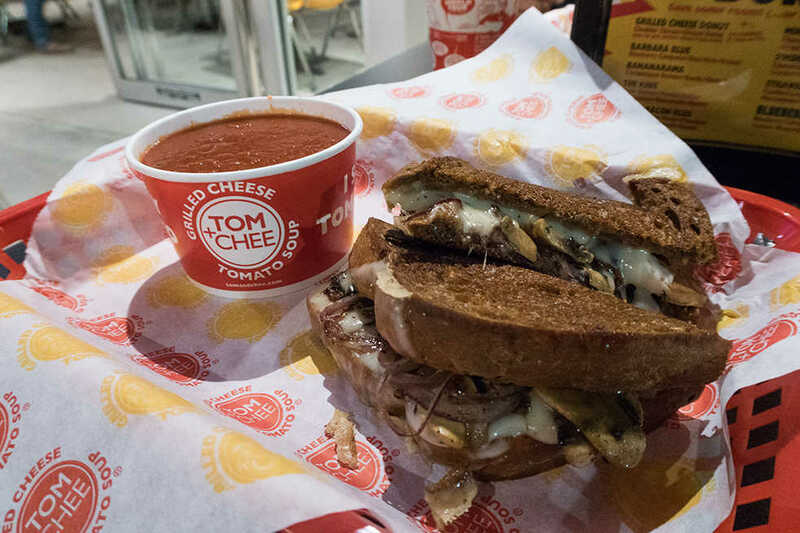 The menu at Tom + Chee includes many unique types of specialty grilled cheese sandwiches, so it is much more than just throwing some bread, butter and cheese onto a hot skillet. The “Fancy Grilled Cheese” section of the menu attempts to stick to the grilled cheese theme of the restaurant but really just has a bunch of different sandwiches, including turkey and cheese, spicy pepperoni and ham and cheese. Some of these sandwiches are pretty creative, however, such as the grilled mac and cheese sandwich made of its namesake and two different types of extra cheese. While the standard sandwiches are good, another option is for the customer to make his or her own combinations. Tom + Chee offers five types of bread, eleven different cheeses (from which the customer may choose two) and 23 toppings, including meat, veggies and even potato chips. Not only are there sandwiches, but a customer can also get a salad if they are trying to keep the meal healthy or choose from a few different types of tomato soup. Without a doubt the best part of the menu is the grilled cheese donut. With nine to choose from, there is a perfect sandwich for everyone. Donuts are even offered as bread for the make-your-own sandwich option. These specialty donuts are excellent, and anyone with an empty or even a slightly full stomach should try one. Located near the intersection of Howell Mill and 14th Street, Tom + Chee is not far from Tech’s campus and just down the road from Home Park. It is a great spot for lunch or just a snack, and there are even healthy options. The concept may not sound like something that should be successful, but they have earned their success by serving great food.